On Day 3, Jo and I pretty much stayed put. We didn’t head into town or even leave the Balboa Peninsula for that matter. Half the reason was because it is awesome and relaxing just hanging out there, nothing more needed. We checked out the beach, went out on the pier to Ruby’s. Ruby’s is an old style diner, burgers, shakes, and such. Except instead of the traditional location on the side of the road, this one was on the end of the pier. After that the most transport we did anywhere was rent some bikes and ply the entire Balboa Peninsula. That was pretty cool, checking the out the area. Later on she’ll have some awesome photos of our exploration posted and I’ll post links to them here. Day 4 started at 7:00am. Our escape route from the Peninsula was to give our buddy Mike a ride into work, then drive the last few miles into Santa Ana Station and ride the train into LA. So far being this far from LA, has posed serious complexity to actually getting into the city. Any route, includes multiple transfers and approximately 2 hours and 46 minutes at minimum. There is one bus on the Peninsula, which I must admit is fairly impressive considering. It has almost zero ridership this far south on its route and the people that do ride it are almost all maids or some other service sector employees that come to the Peninsula and then leave the minute they’re done working. I get the notion this is a running theme in LA. Half the population seems to serve the other half, directly. The bus that serves the peninsula is the #71 Orange County Transit Authority Bus Route. The primary route goes up and down highway 55 off of the Peninsula and into the mainland area. We managed to head out the door around 8:05am. This was almost miraculous considering Jo usually won’t budge before 9am. We dropped our comrade Mike off at the office and headed toward Santa Ana Station. We pulled out and headed for the sprawling monstrosity of a highway. We rolled onto 55 north bound and that turned into the lovely 8 lanes of chaos, frustration, road rage, and anger. It was beautiful in its own sickening way. We made good time and in about 25 minutes arrived at the station. We took a minute trying to figure out where to park, eventually found a good place in the parking garage on deck 3. We walked into the station with plenty of time for our 9:58am departure. The Santa Ana Station was a masterpiece among stations. Simple, mission style architecture. The station stood about 3 stories tall and now serves multiple purposes for the city of Santa Ana. Downstairs was a pleasant waiting room. In one corner was a souvenir shop. Opposite of that was a little cafe. On the far end of the station stood Jo and I at the entrance, and in the other corner parallel to us was the ticket counter. We strolled up, and inquired about our reservation. The ticket clerk courteously printed the tickets, and handed them over to us. Irony, out of the two tracks that stood outside, he said track #2 and we ended up waiting and boarding the correct train on track #1. The Pacific Surfliner pulled in at exactly 9:57am. Like a crack team of operatives, we rolled out of the station at 9:58am. The trip was pleasant, and definitely beat trying to drive the Interstates or highways into downtown! After about 10 minutes both Jo and I passed out. We both needed that extra few minutes of sleep, being up late every night so far. We awoke about 10 minutes out of the station. As we passed gateway point into Union Station I realized Los Angeles, compared to about 15 years ago when I visited before, has drastically improved rail operations – or simply put, has rail operations again. We say Metroliner Trains, other Amtrak Trains coming in, and off on other alignments one could see the subway cars. Overall impressive. Los Angeles finally wins some points for drastic improvements from the past! We got off there and aimed ourselves for the front entrance of the station and our new mission, which was made en route via txting, was to find the Dash B. The Dash B, under this new plan to go check out MOCA, would take us directly there. We almost made it out the door without knowing what the Dash B was, or where to find it, but gleaned the information from an information attendant at the information booth. With a few quarters in our pockets we made our way out of the station, across the street, and onto an arriving Dash B bus. The Dash B route was cool. The little short buses, running a small route downtown, with a 7-8 minute frequency. All this frequency and such, for a measly quarter! I’ll have to check information on these little routes later, they seem interesting. In no less than 10 minutes we arrived at MOCA and made our way under the outside display. David met us there and we toured the MOCA, while MOCA was closed. It is truly awesome knowing people that can hook a person up with tours like that. After that Jo, David, Sarah, and myself snagged some great sandwiches around the corner. We discussed the other ideas for the days’ activities and David suggest we ride with Sarah down to Long Beach to save a few minutes and have more time to check stuff out. We deemed that a grand and awesome idea and after lunch said our farewells and headed off with Sarah. Sarah got us into downtown Long Beach where we immediately found the Blue Line Light Rail and jumped another bus to tour around Long Beach. We got to see some cruise ships, checked out a slight bit of the loading cranes from a distance, and generally just kind of viewed the city from the little tour bus we were riding. s for that single run. LA has done a very good job with their system. I’m now going to have to dig up the ridership numbers for the respective light rail lines. We arrived back downtown at the transfer point to the Red Line. About 240 people got off of the Blue Line and the majority headed up to the level above to board the Red Line. Within 5 minutes the Red Line blazed into the station as a subway train does, with heavy breaking the train came to a stop. Everyone boarded quickly and off zoomed the subway train en route to Union Station. It is always impressive the speed and mobility enabled by a subway system. The Red Line, as only a subway train could provide, eclipsed the ridership of the light rail train by a couple hundred. I wasn’t counting but my estimates where at minimum 4-5x as many as was on the Blue Line. Again, I need to look up the statistics on this line too. Jo and I finally arrived back at Union Station with 12 minutes to spare. We figured out which track our train was preparing to depart from and headed up. We boarded the train with 4 minutes to spare, and at 4:10pm sharp, we rolled out of Los Angeles Union Station. We arrived back in Santa Ana on time and jumped in the ole’ hooptie for our last stretch back to Balboa Peninsula. 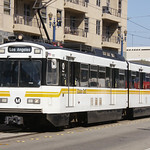 I couldn’t help but think, “LA actually has better transit than Portland does, what gives?! Why do I still find it the last place I’d suggest to live?” and immediately came up with a few thoughts on that. Portland has contained itself in a reasonable boundary to serve. LA is and continues to be a total zoning catastrophe. The roads and blocks in Portland remain human size versus auto-oriented size, which LA fails miserably at. LA has an attitude still and barely a soul knows there is anything besides their car. Portland absolutely knows there are many options besides the car. Downtown LA could be beautiful and alive, instead there is a lot of work to do still. Even though there are thousands and thousands more living in downtown LA than in downtown Portland, the later has much more life after 5pm than the former, massively larger city. LA has vast potential to recover from the last half dozen decades of bad zoning and lack of sustainable infrastructure construction. LA is a city with a short history, but a solid one with a world spotlight fixed directly at its heart. LA has the stars, it has the port (ok, so that is Long Beach, but it is the metropolitan area), it has a fair environment, and overall sits in an area that people find attractive. The only problem is overcoming the damning zoning and livability issues it has. I have no doubt LA will overcome these issues, but there are definitely some very serious speed bumps on the way. I’m going to catch 40 winks before jumping back aboard the flanged wheel for our next stretch of the journey. With that here’s a few shots from day 1 and day 2 of the trip. comfortable! My lovely Jo is chilling in the Parlor Car. I’ve never been as comfortable in a plane, bus, or any other mode ever. Maybe a cruise ship might give a train a run for its money. I challenge anyone to present a mode that is as remotely comfortable and human as rail travel. Next big trip, includes a few thousand rail miles. I am sure Jo and I will land on a few buses during this trip. If any auto usage is incurred, it will be through absolute necessity and with slight disdain. September 26th departing Portland Union Station @ 2:25pm on Amtrak Train #11. September 27th arriving Los Angeles Union Station @ 9:00pm on Amtrak Train #11. Chilling the OC life & roaming the LA mega sprawl via Metro. September 30th departing Los Angeles @ 2:30pm on Train #2 and Arriving Maricopa @ 10:07pm on Train #2. October 7th departing Maricopa @ 1:02am on Train #1 and arriving Los Angeles @ 9:40am on Train #1. Chilling in LA again, and shredding the OC. 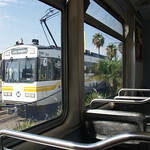 October 9th departing Los Angeles @ 10:15am on Train #14. October 10th arriving Portland @ 3:40pm on Train #14. I just wanted to throw together a montage of videos from the Green Line opening. The Green Line green people invade Portland. This is, to note, NOT TriMet but a community group organizing. This is why I say private enterprise HAS to get involved to really make things lively and successful. Without, nobody cares. bobrpdx put together this video, which shows the First Ride Event. The following is Part 1. I am truly impressed by the Phoenix Community’s ongoing support of the light rail system. Phoenix almost, maybe it does, outdo Portland in support of light rail these days. Either way, it seems oddly amazing that a city known as a blight* upon America, is working so hard and diligently to become an impressive and modern city. All of the below sites can be found by a simple search on Google of Phoenix Rail Life. Light Rail Blogger: I’ll admit it, Tony’s site is one of my favorite. He has a real human element about his entire blog and life going car-less in a city not so well known for car-less survivability. Downtown Phoenix Journal: This is a new blog read to me. But obviously is connected to efforts for successful light rail and urban lifestyles. Enabling people to really step up in life. It is an impressive site – I dig it. Rail Life: This is one of the first sites I saw pop up related to Phoenix Light Rail. As per the topic of this blog entry, Rail Life’s Blog has an entry on activities in Phoenix. This is a common thing to see on this and the other blogs. Light Rail Hot Spots: This is just a one off page, but still it is a site of interest. This is something that I think Portland should really endeavor to improve, and which I would be more than happy to kick off. Is there anyone else out there who could kick in some assistance? Hit me up at adron [@] adronbhall [dot] com. * I didn’t come up with that adjective, a local Portland resident tossed me the word blight when I asked for a description of Phoenix, Arizona while riding about on our newly opened Green Line. After work, just for kicks, I decided to check out how that Green Line Ridership was for the 6:18pm Departure from PSU. I headed out of office a few minutes before I took up a stand at the north bound Pioneer Square Stop. There was a Wackenhut Transit Security staffer standing on the platform, who walked by me and directed a guy to stop sitting on the MAX stop curb. The individual was sitting there, not bothering a soul, with his legs in the street. I could understand the reasoning, but, the way the security guy said it, “There’s plenty of courthouse you don’t need to sit there” made him out as rather crass. No smoothness about that action. A few moments later a beautiful young lady was asking some of the street kids where Satyricon is, which surprisingly none of them knew. So I asked her as she walked her model self my direction, "did they tell you where it is?" to which she replied, "naw, they didn’t know". I smiled and gave a quick direction of, “either jump on the MAX coming and get off the third stop from here, or just keep walking”. She replied with a smile, “oh cool, thanks, but I think I’ll walk I need to walk”. When she walked away toward Satyricon I was fine with that. She was, after all, one of those painstakingly beautiful young ladies. After she waltzed off I boarded the Green Line at 6:20pm. In short order we began rolling and came to the next stop. There she boarded and spotted me. I told her, “you sure didn’t make it very far” with some jest. She pulled the cranked ear phones thrashing metal from the speaker buds and said, “I know, but do you see what I’m wearing”. She pulled up her high heeled boots she was wearing and displayed them to me as she walked over. She sat down and we chatted about the bands that where playing. Crew (?spelling) and two others. Local bands, and jeez it made me feel geezerly not knowing what the heck was up with the younger scene. It seems if it isn’t one of the big metal acts out of Europe I tend not to have a clue as to what a band is. We rolled on, I pointed out Satyricon to the young lady to which she bounced off, euphoric as to achieving her destination. Again, we rolled on from there, to the next stop, on through the turn at Union Station and across the cross over and stopped at the light. There we stopped and waited a moment for the signal to turn. The Steele Bridge held steady to our left as a Union Pacific freight inched across the bridge. Her horns starting to blare, causing some of the nearby runners to pay a little more attention. We pulled up onto the bridge without delay as the signal switched and made it across and into the Rose Quarter. This was definitely smoother than opening day. At this point the train started to gain a number of passengers, but barely any where heading to Clackamas. Most were conversing and I was able to ascertain that about 5-6 people on the car I was on were heading to Clackamas, or along that line. Everyone else aboard, which numbered about 40 people, were headed somewhere within the Banfield Corridor between Lloyd Center out to Gateway Transit Center. Clearing the Lloyd Center stop we cruised out at top speed toward 42nd Avenue. Without a blink we pulled in and gained a half dozen riders and shed about the same. The time read 6:42pm as we made our way, passing or passing traffic on I-84. At this time of day, and with the sour job market a factor, there was little traffic along I-84. The interesting bit is, if one were to do the math, with our three lines carrying passengers, the MAX with its one track was matching the number of people in that 3 lanes of Interstate Traffic. When in full use, the 3 lanes absolutely carries more than the single lane of light rail traffic, but right the fact was there wasn’t that many people traveling along the corridor. We pulled into Gateway and there were several officers, passengers, and others loitering about waiting for buses, light rail, or to depart across the way toward the shopping areas. We got rid of a few passengers but gained an easy 20 at this stop. That put us up to an easy 55-60 people. The traffic on I-205 was a slightly different story than the I-84 traffic. It wasn’t much different, but it was a little lighter along this corridor. Considering the traffic, general activity, and almost chaos of just 1-2 years ago this lower traffic demand is surreal. The Green Line LRV Set made it about 1000ft from Gateway and stopped. It appeared that a fare inspector detrained or maybe he was already there? I’m not sure, but it was somewhat strange that he was standing there between the LRV Set as we rolled away after stopping. At the next stop the friendly Mexican Family detrained. They were smiling and talking in their native language, which always puts my mono-lingual mind at a disadvantage. I did however pick up a few of the kind words and chit chat they were having among themselves. It is refreshing to hear conversation like this, calm, caring, among a family. The one factual bit I had picked up, was that they were headed to Target. We pulled into the Division Station in a few seconds and on into the Powell Station. I was going to detrain at the Powell Station, but I decided to head on down and detrain at the Foster Station and jump on a #14, which I would then take and switch to Powell and get a #9 at that point. Being I have seen the Powell Street Stop before, and its rather long transfer path, I figured it was time to check out the Foster Stop and see how that stop area was shaping up. I took a walk down to the Lents/Foster stop area, and began my wait for the #14 west bound. I walked along Foster instead of immediately boarding the waiting #14. I must admit, this is a super easy and comfortable transfer point with the #14, and #10 if it is there, sit waiting to depart. Often one can board the bus there and wait inside the bus. This will be a bonus for people transferring here when it gets cold. The area has a somewhat small town center feel to it, not sure if it is considered a town center, but sure seems that it is. There are several shops and such, a bakery around the corner, and a cafe just a block or so down the street from the stop. The #14 came along in no less than a minute or so of my reaching the first bus stop I came to. I stepped aboard with one other waiting passenger. She was a strangely frumpy thing, but smiled with the warmth of a friendly stranger. By approximately 60th we had about 11 people aboard. As we pulled into the newly growing and lively 60th street area we gained a few more. This area, has really surprised me over the last 2 years. 2 Years ago there was barely 1-2 store fronts out of 20+ that had operative businesses. Now, in the depth of this new depression, this street had maybe 2-3 empty store fronts out of the 20+ that are along this street. In addition, along the edges of the area, around 63rd running east and 58th running west, store fronts have been rebuilt. These places now host operating businesses. Overall it makes for a truly growing and lively area. Food choices from Vietnamese Bakery to Hawaiian Barbecue. We rolled by the famous Devil’s Point and onto the transfer point at Powell for the #9. I strolled off of the bus and over to the 52nd & Powell stop for my transfer point wait time. I checked via transit tracker to see what the ETA was, which shot me back a 6 minute estimate. I decided that was fine to just wait, if it had been 10 or more minutes, I’d have pulled the laptop out and continued typing at this very entry. The homeward bound #9 arrived with one of the regular drivers. He nodded as I boarded with my pass, and I walked around the guy continuing to count change for his fare. I took a seat and whipped the laptop out for this last segment of my trip. After barely a paragraph or two I found myself in another conversation with a few of the riders. The topic was of a general nature about what was along this route. I gladly provided some tidbits about what they where looking for. Wanderlust quenched I arrived home, and that was my commute home, around about east side Portland. The downtown Portland transit mall is sort of like BRT. It has dedicated right of way solely for use by the buses and light rail. Outside of the transit mall we have several other places leading into town where the buses break off from traffic and are in bus only lanes. These lanes work exceptionally well in most places. Powell Street – Powell Street leading to the Powell and Milwaukee, and from Powell and Milwaukee to about 800ft. before the Ross Island Bridge both have areas of bus only right of way. The lanes are however not separated by any physical device, and often there are wandering cars or trucks that roll into the lane causing delays and such. Hawthorne/Madison – Leading up to the Hawthorne Bridge there is a lane for almost the length of Madison that has a bus only lane for certain hours of the day. I believe it ends at 9:00am, but it also works very effectively against congestion. I ponder where else there might be places for BRT style break outs like this. Are there any other routes in the area that could directly benefit from dedicated lanes, or possibly even separated dedicated BRT style right of ways?